Over the weekend I was catching up on some of my internet readings, one of which is Timo Sugliani's excellent weekly Tech Links (highly recommend a follow). 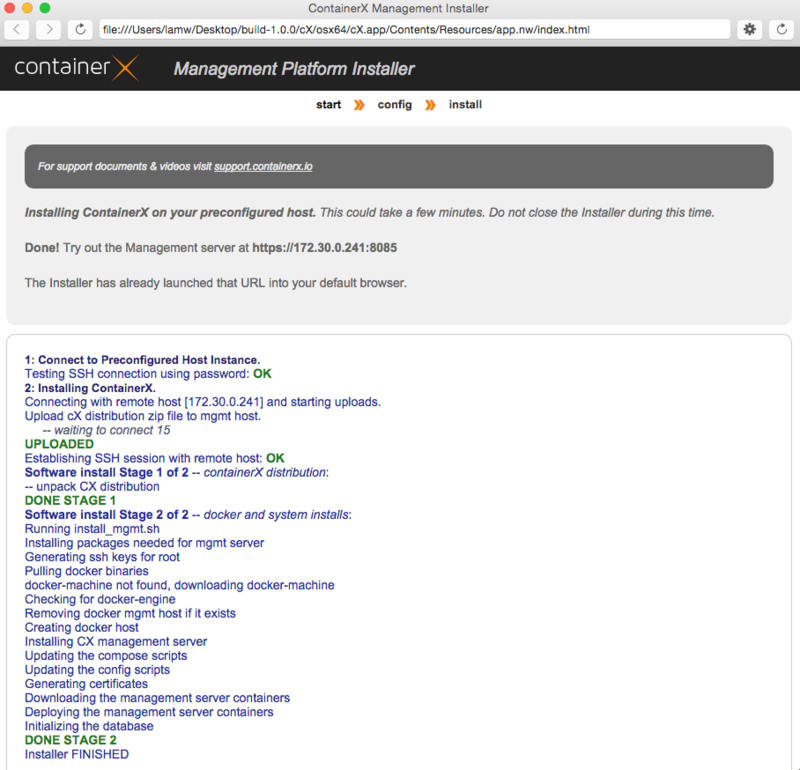 In one of his non-VMware related links (which funny enough is related to VMware), I noticed that the recent Container startup ContainerX has just made available a free version of their software for non-production use. Given part of the company's DNA included VMware, I was curious to learn more about their solution and how it works, especially as it relates to VMware vSphere which is one of the platforms it supports. 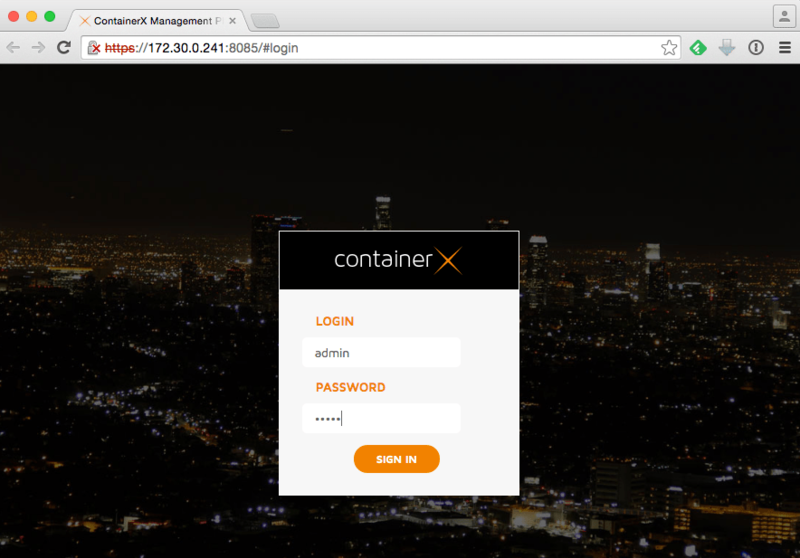 ContainerX offers a single pane of glass for all your containers. Whether you are running on Bare Metal or VM, Linux or Windows, Private or Public cloud, you can view your entire infrastructure in one simple management console. 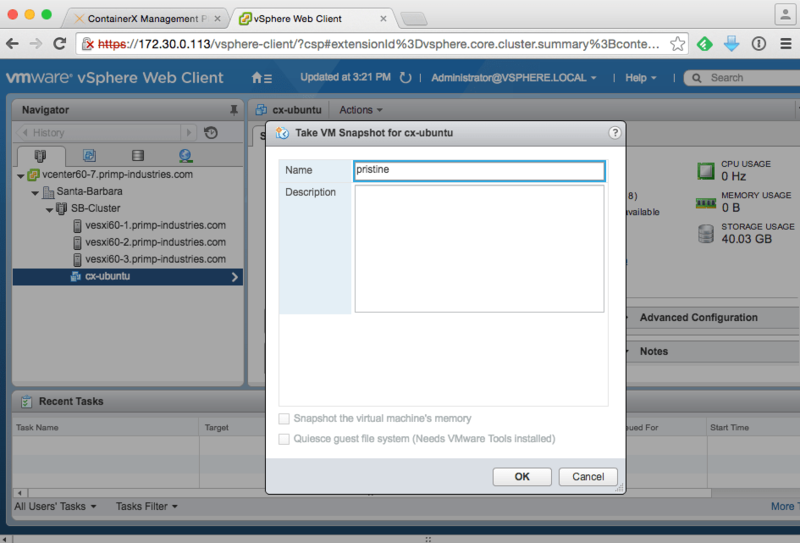 In this article, I will walk you through in how to deploy, configure and start using ContainerX in a vSphere environment. Although there is an installation guide included with the installer, I personally found the document to be a little difficult to follow, especially for someone who was only interested in a pure vSphere environment. The mention of bare-metal at the beginning was confusing as I was not sure what the actual requirements were and I think it would have been nice to just have a section that covered each platform from start to end. Step 1 - Download the CX Management Host installer for your OS desktop platform of choice. If you are using the Mac OS X installer, you will find that the cX.app fails to launch as it is not signed from an identified developer. You will need to change your security settings to allow an application which was downloaded from "anywhere" to be opened, which is a shame. Step 2 - Accept the EULA and then select the "On Preconfigured Host" option which expects you to have a pre-installed Ubuntu VM to install the CX Management Host software. If you have not pre-deployed the Ubuntu VM, stop here and go perform that step and then come back. Step 3 - Next, provide the IP Address/hostname and credentials to the Ubuntu VM that you have already pre-installed. You can use the "Test" option to verify that either the SSH password or private key that you have provided is functional before proceeding further in the installer. Step 4 - After you click "Continue", the installer will remotely connect to your Ubuntu VM and start the installation of the CX Management Host software. This takes a few minutes with progress being displayed at the bottom of the screen. If the install is successful, you should see the "Install FINISHED" message. At this point, you have successfully deployed the CX Management Host. The next section will walk you through in setting up the CX Ubuntu Template which will be used to deploy your Containers and Applications by the CX Management Host. 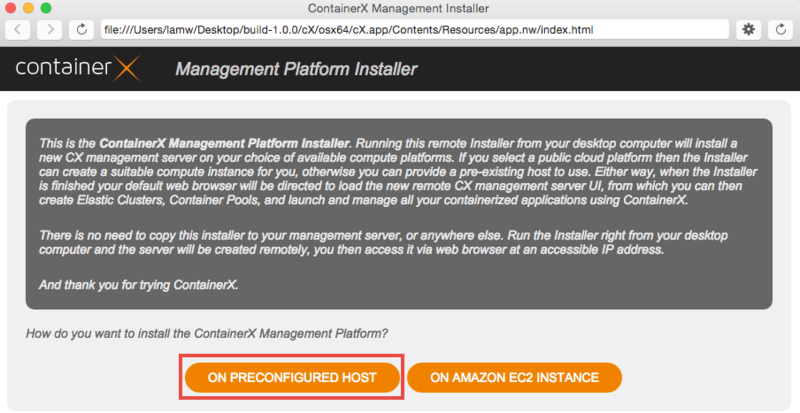 Before we can create a vSphere Elastic Cluster (EC), you will need to deploy the CX Ubuntu OVA Template which will then be used by the CX Management Host to deploy CX Docker Hosts to run your Containers/Applications. When I had originally gone through the documentation, there was a reference to the CX Ubuntu OVA but I was not able to find a download URL anywhere including going through the ContainerX's website. I had reached out to the ContainerX folks and they had updated KB article 20960087 to provide a download link, appreciate the assistance over the weekend. However, it looks like their installation documentation is still missing the URL reference. In any case, you can find the download URL below for your convenience. 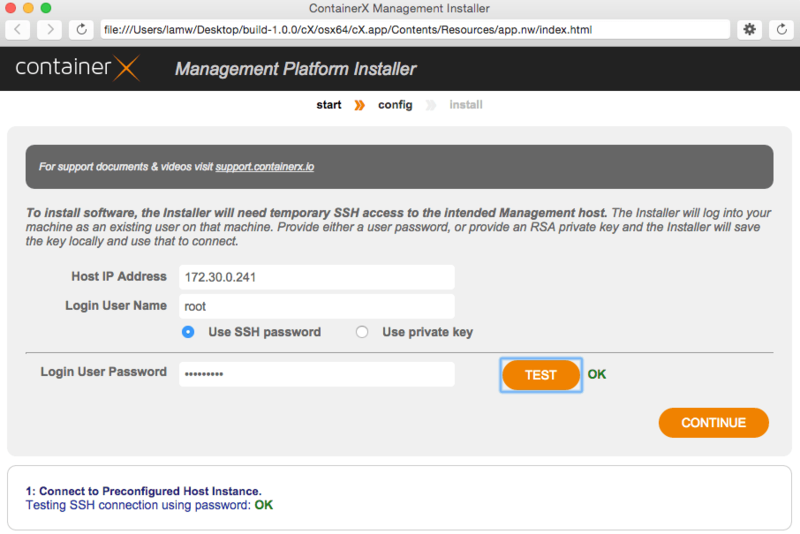 Step 1 - Download the CX Ubuntu OVA Template (http://update.containerx.io:8080/cx-ubuntu.ova) and deploy (but do NOT power it on) using the vSphere Web/C# Client to the vCenter Server environment that ContainerX will be consuming. Note: I left the default VM name which is cx-ubuntu as I am not sure if it would mess up with the initial vSphere environment discovery later in the process. It would be good to know if you could change the name. Step 2 - Take a VM snapshot of the powered off CX Ubuntu VM before powering it on. Step 2 - Enter your vCenter Server credentials and then click on the "Login to VC" button to continue. Step 3 - Here you will specify the number of CX Docker Hosts and the compute, storage, and networkings resources that they will consume. The CX Docker Hosts will be provisioned using VMware Linked Clones based off of our CX Ubuntu VM Template that we had uploaded earlier. If you had skipped this step, you will find that there is not a drop down box and you will need to perform that step first before you can proceed further. Note: It would have been nice if the CX Ubuntu VM was not detected, that it would automatically prompt you to deploy it without having to go back. I did not even realize this particular template was required since I was not able to find the original download link in any of the instructions. Step 4 - An optional step, but you also have the option to create what is known as Container Pools which allow you to set both CPU and Memory limits (supports over-commitment) within your EC. It is not exactly clear how Container Pools work but it sounds like these are being applied within the CX Docker Hosts VMs? Step 5 - Once you have confirmed the settings to be used for your vSphere EC, you can then click Next to being the creation. This process should not take too long and once everything has successfully been deployed, you should see a success message and a "Done" button which you can click on to close the wizard. 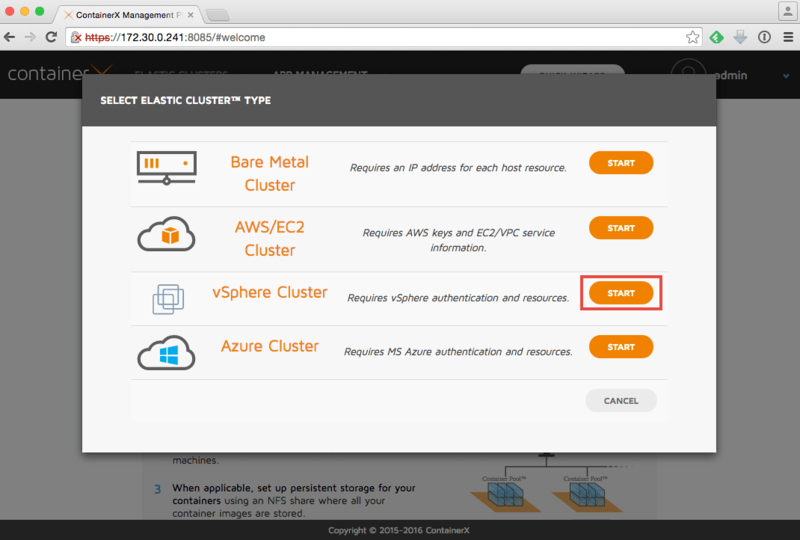 Step 6 - If we go back to our CX Management UI home page, we should now see our new vSphere EC which in my example is called "vSphere-VSAN-Cluster". 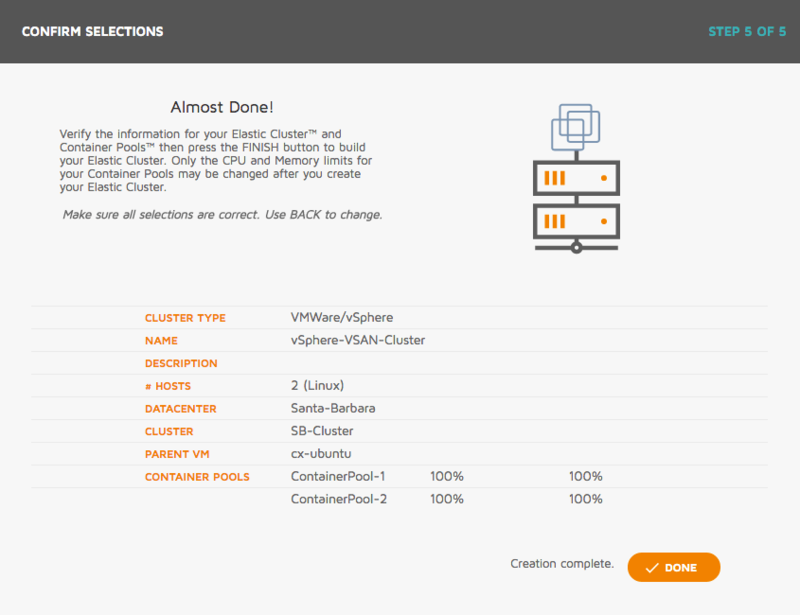 There is some basic summary information about the EC, including number of Container Pools, Hosts and their utilization. You may have also noticed that there are 12 Containers being displayed in the UI which I found a bit strange given I have not deployed anything yet. I later realized that these are actually CX Docker Containers running within the CX Docker Hosts which I assuming is providing communication back to the CX Management Host. I think it would be nice to separate these numbers to reflect "Management" and actual "Application" Containers, the same goes for resource utilization information. 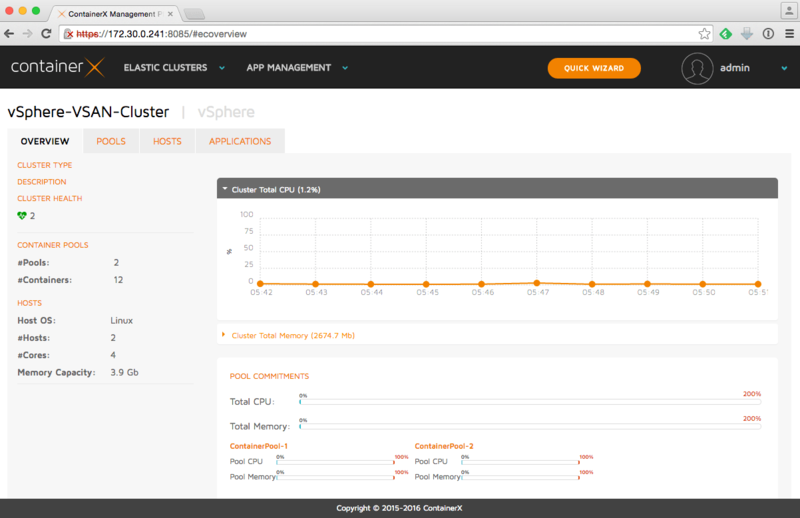 Under the "Applications" tab of your vSphere EC, you can deploy either a standalone Docker Container or some of the pre-defined Applications that have been bundled as part of the CX Management Host. We will start off by just deploying a very simple Docker Container. 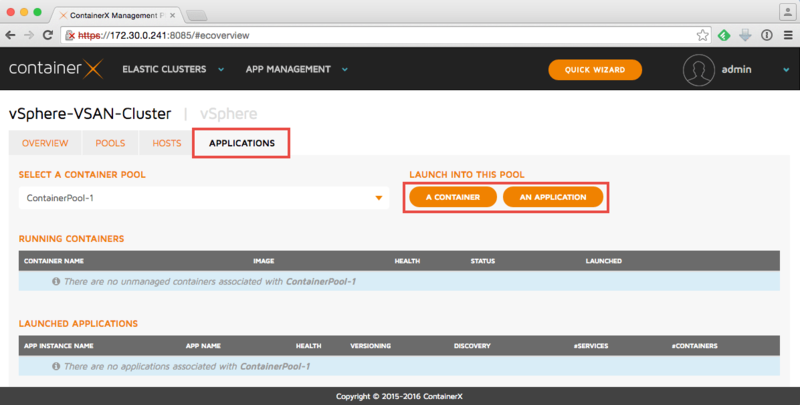 In this example, I will select my first ContainerPool-1 and then select the "A Container" button. Since we do not have a repository to select a Container to deploy, click on the "Launch a Container" button towards the top. Note: I think I may have found a UI bug in which the Container Pool that you select in the drop down is not properly being displayed when you go deploy the Container or Application. 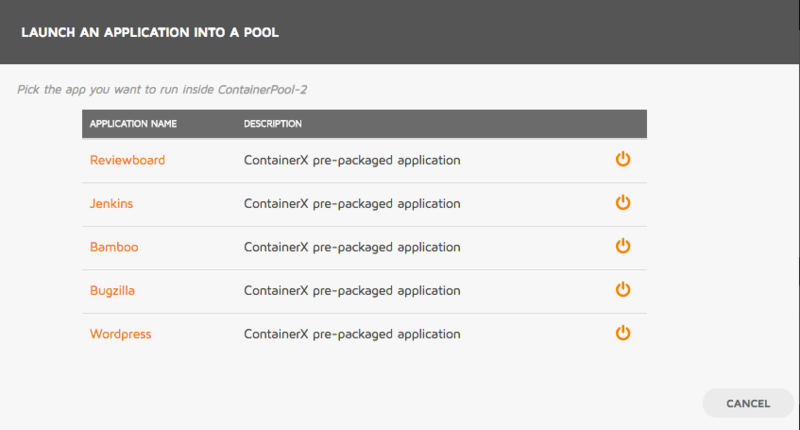 For example, if you pick Container Pool 1, it will say that you are about to deploy to Container Pool 2. I found that you had to re-select the same drop down a second time for it to properly display and whether this is merely a cosmetic bug or its actually using the Container Pool that I did not specify. Step 1 - Specify the Docker Image you wish to launch, if you do not have one off hand, you can use the PhotonOS Docker Container (vmware/photon) and specify a Container name. You can also add additional options using the advanced settings button such as environmental variables, network ports, Docker Volumes, etc. 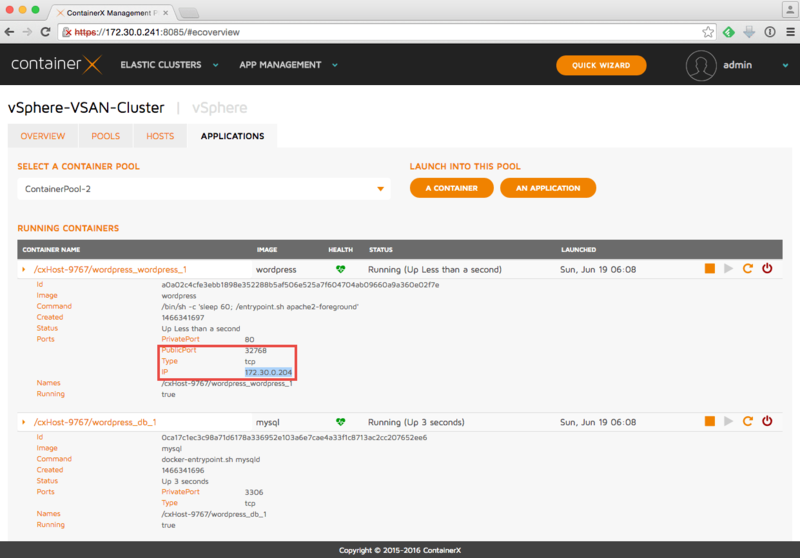 For this example, we will keep it simple, go ahead and click on "Launch App" button to deploy the Container. Step 2 - You should see that our PhotonOS Docker Container started and then shortly after exited, not a very interesting demo but you get the idea. Note: It would be really nice to be able to get the output from the Docker Container, even running a command like "uname -a" did not return any visible output that I could see from the UI. The other option is to deploy a sample application that is pre-bundled within the CX Management Host (I assume you can add your own application as it looks to be just a Docker Compose file). 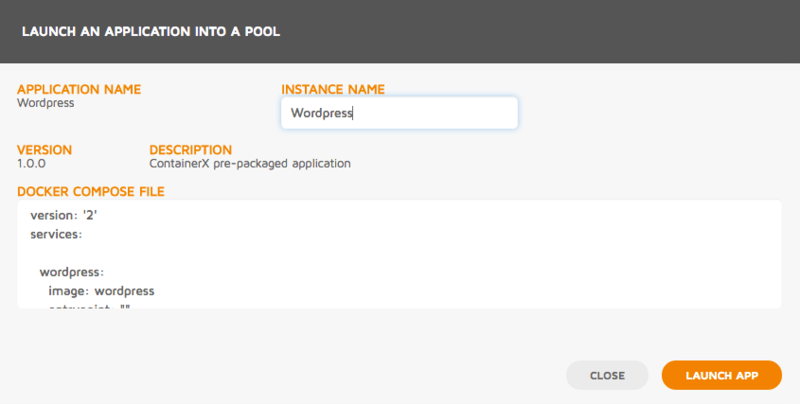 Select the Container Pool from the drop down that you wish to deploy the application and then click on the "An Application" button. 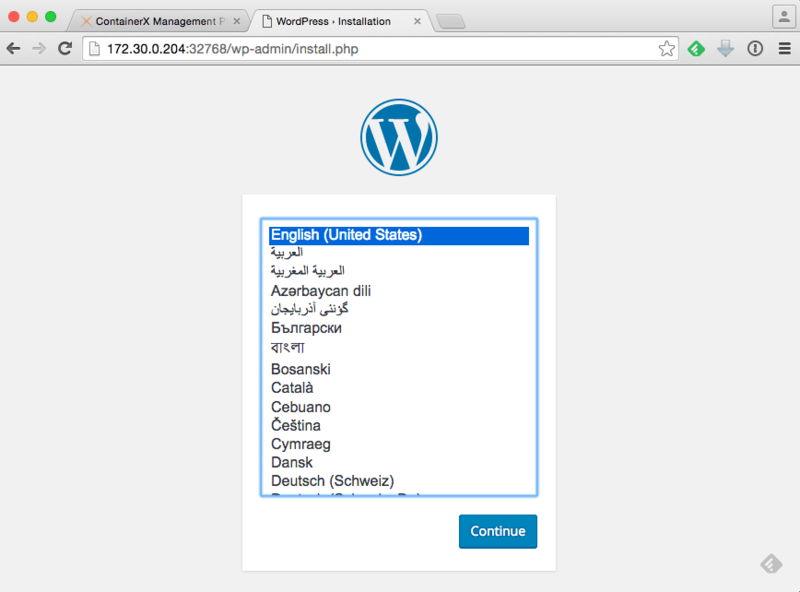 In our example, we will deploy the WordPress application. Step 1 - Select the application you wish to deploy by click on the "Power" icon. 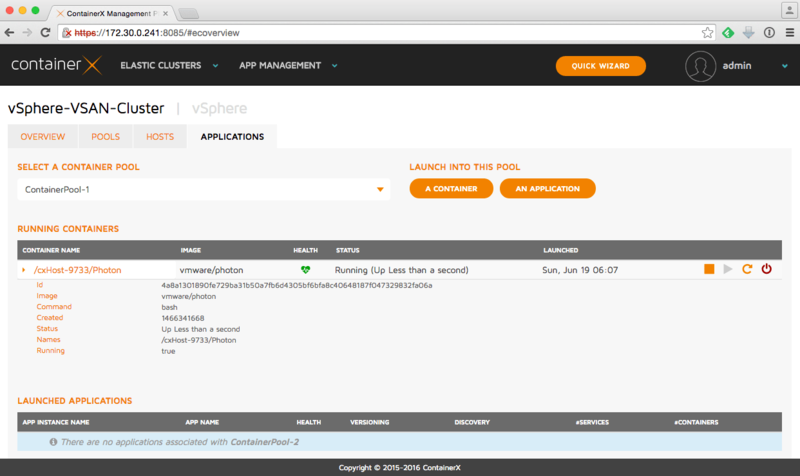 Step 2 - Give the application a name and then click on the "Launch App" to deploy the application. Step 3 - The deployment of the application can take several minutes, but one completed, you should see in the summary view like the one shown below. You can also find the details of how to reach the WordPress application that we just deployed by looking for the IP Address and the external port as highlighted below. Step 4 - To verify that our WordPress application is working, go ahead and open a new browser and specify the IP Address and the port shown in the previous step and you should be taken to the initial WordPress setup screen. If you need to access the CX Docker Hosts whether it is for publishing Containers/Applications by your end users or for troubleshooting purposes, you can easily access the environment information under the "Pools" tab. There is a "Download access credentials" which contains zip file containing platform specific snippets of the CX Docker hosts information. Since I use a Mac, I just need to run the env.sh script and then run my normal "Docker" command (this assumes you have the Docker Beta Client for Mac OS X, else you will need a Docker Client). You can see from the screenshot below the three Docker Containers we had deployed earlier. Having only spent a short amount of time playing with ContainerX, I thought it was a neat solution. The installation of the CX Management Host was pretty quick and straight forward and I was glad to see a multi-desktop OS installer. It did take me a bit of time to realize what the actual requirement was for just a pure vSphere environment as mentioned earlier, perhaps an end-to-end document for vSphere would have cleared all this up. The UI was pretty easy to use and intuitive for the most part. I did find it strange not being able to edit any of the configurations a bit annoying and ended up deleting and re-creating some of the configurations. I would have liked an easier way to map between the Container Pools (Pools tab) and their respective CX Docker Hosts without having to download the credentials or navigate to anther tab. I also found in certain places that selection or navigation of objects was not very clear due to the subtle transition in the UI which made me think there was a display bug. 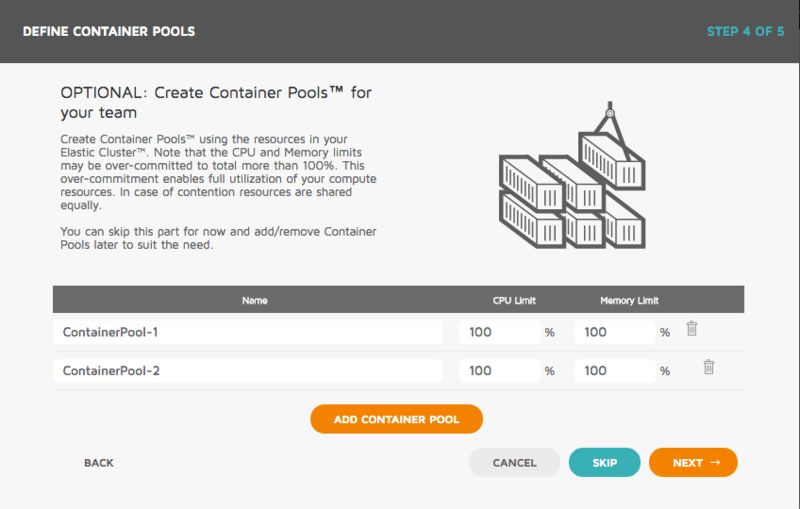 I am still trying to wrap my head around the Container Pool concept. I am not sure I understand the benefits of it or rather how the underlying resource management actually works. It seems like today, it is only capable of setting CPU and Memory limits which are applied within the CX Docker Host VMs? I am not sure if customers are supposed to create different sized CX Docker Host VMs? I was pretty surprised that I did not see more use of the underlying vSphere Resource Management capabilities in this particular area. The overall architecture of ContainerX for vSphere looks very similiar to VMware's vSphere Integrated Containers (VIC) solution. Instead of a CX Docker Host VM, VIC has a concept of a Virtual Container Host (VCH) which is backed by a vSphere Resource Pool. VIC creates what is known as a Container VM that only contains the Container/Application running as VM, rather than in a VM. 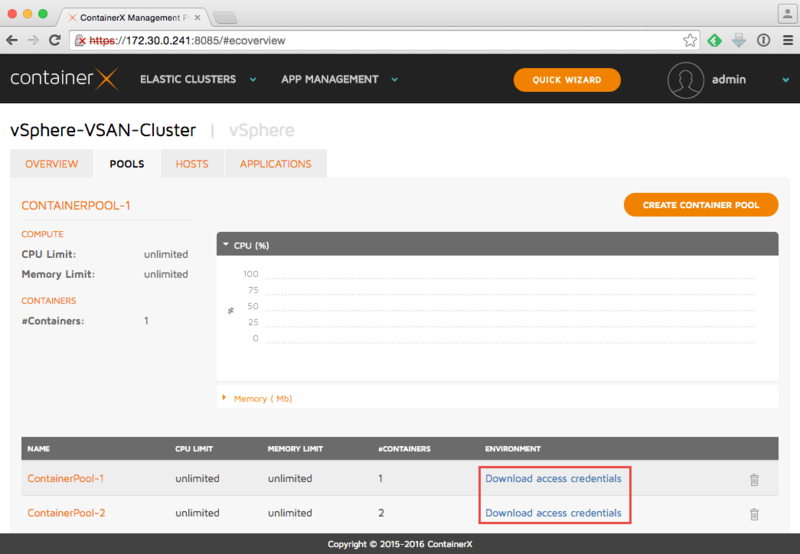 These Container VMs are instantiated using vSphere's Instant Clone capability from a tiny PhotonOS Template. Perhaps I am a bit biased here, but in addition to providing an integrated and familiar interface to each of the respective consumers: vSphere Administrators (familiar VM construct, leveraging the same set of tools with extended Docker Container info) and Developers (simply accessing the Docker endpoint with the tools they are already using), the other huge benefit of the VIC architecture is that it allows the Container VMs to benefit from all the underlying vSphere platform capabilities. vSphere Administrators can apply granular resource and policy based management on a per Container/Application basis if needed, which is a pretty powerful capability if you ask me. It will be interesting to see if there will be deeper integration from a management and operational standpoint in the future for ContainerX. All in all, very cool stuff from the ContainerX folks, looking forward to what comes next. DockerCon is also this week and if you happen to be at the event, be sure to drop by the VMware booth as I hear they will be showing off some pretty cool stuff. I believe the ContainerX folks will also be at DockerCon, so be sure to drop by their booth and say hello. 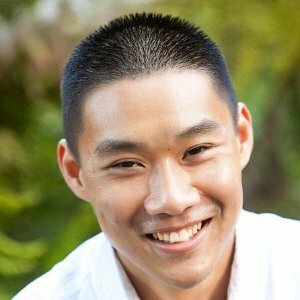 Thanks for the great detailed article @lamw! We have taken all your comments into account (some of which are already fixed in our latest version 1.0.1). I was about to write a long detailed comment about deeper integration with vSphere, but it might be better to chat 1:1. Let me know a good time. HOW DO I USE/FIND/INSTALL VIC PLUGIN? Thanks for the article on cotainerX. I successfully got it working on my home lab. But now you have me interested in VIC. I installed Photon/VIC and successfully got it running using the github documentation. I can create VHC (Virtual Host Containers) via CLI. I see this wonderful VIC walk-through on VMware blogs (link below). The walk-through shows a beautiful plugin that works nicely with the GUI. For the life of me, i cannot find any further documentation on installing the VIC Plugin from the VMware blog. Is the vcenter plugin real? Does anyone know where i can get more information on installing the plugin for VIC? Any help would be greatly appreciated.